Last weekend, we hosted an “African Tea Experience” at the tea bar. Unlike our World Tea Tasting Tour sessions, this one was a private party that we donated to a local nonprofit organization for a silent auction fundraiser. Instead of just tasting some tea we made this a more immersive experience, including — among other things — food. My first thought was to use the Hipster Hummus that we’ve prepared here before, but it’s really more of a Middle Eastern hummus than an African one. What’s the difference? I’m glad you asked. Hummus is currently thought of as a Middle Eastern dish. Lebanon is pushing the European Commission to declare hummus a uniquely Lebanese food. In Israel, hummus is a staple. You can find it anywhere in Turkey or Palestine. But that’s not where the dish originated. According to Gil Marks’ Encyclopedia of Jewish Food, the earliest known recipes for hummus date back to 13th century cookbooks from Cairo. It’s still a popular dish throughout northern Africa, and there are few differences between the African version and the Middle Eastern version. For this event, I decided to make a more Africanized version of our regular hummus. 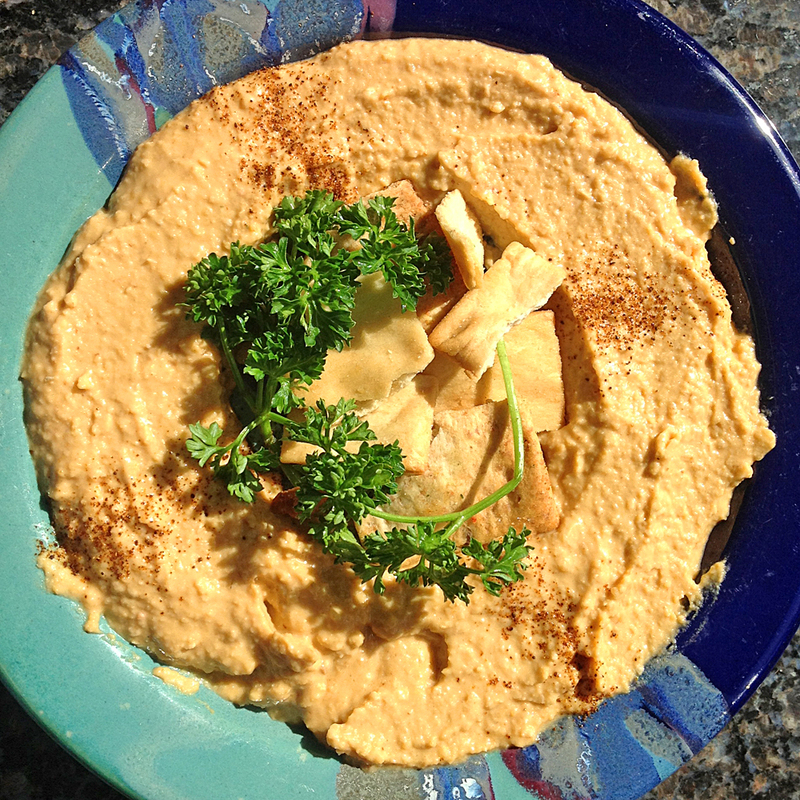 All hummus is based on chickpeas (or garbanzo beans) and tahini (sesame paste). The primary ingredient difference in the African version is cumin. I decided to add red rooibos, which is a uniquely South African tisane (it’s often called “tea,” but since it isn’t made from Camellia sinensis, it isn’t technically tea). What we ended up with isn’t traditional, but it did get rave reviews. Despite the hot sauce, it isn’t overly spicy. Personally, I’d consider it almost mild. You could substitute a hot paprika for the milder roasted one that I used to give it more kick, or increase the Sriracha sauce. The flavor of the rooibos definitely comes through, although it’s a bit subtle. Feel free to increase both the amount of leaf and the steeping time if you want more rooibos character. Posted on 5 March 2013, in Food & Tea and tagged Africa, cumin, Egypt, hummus, Israel, paprika, rooibos, South Africa, Sriracha, tahini. Bookmark the permalink. Leave a comment.